Over the past year the Government of Malta has been fully supportive of initiatives taken in the blockchain space culminating in three Acts of Parliament which will come into effect in October 2018. The idea of extending legal personality to innovative technology arrangements has been under study since November 2017 and is the subject of planned legislation. Innovative technology arrangements, which are referred to in Maltese law as a combination of DLT and smart contracts, provide a context which is very similar to that of other operating assets which in the past were afforded legal powers and considered as legal persons to support them in achieving their declared purpose, addressing the important issues of legal capacity and liability, apart from other important issues. There are some disagreements on whether a centralised legal device is a good solution for decentralized technology. Some policy choices in support of legal certainty are also proposed, particularly limiting the benefits deriving from the concept of legal personality for innovative technology arrangements only to registered Maltese innovative technology foundations. Since the Government of Malta adopted a strategic proposal on the subject in June 2017, Malta has been pursuing an innovative path towards the regulation of blockchain. This is to be distinguished from the manner in which it has decided to regulate initial coin offerings (ICOs), virtual assets and services relating to crypto currencies. The goal is legal certainty and support for innovation in this technology and its uses. Blockchain – decentralised or distributed ledger technology (“DLT”) – has clearly challenged traditional legal concepts and rules in many areas. This is therefore a wonderful opportunity for innovation. One area identified in the Maltese Government Consultation Paper issued in February 2018, is that of legal personality for innovative technology arrangements (“ITAs”). The TAS Bill is now a law called the Innovative Technology Arrangements and Services Act, 2018 (Cap. 592, Laws of Malta) (“ITAS”). Although there are some important provisions on legal organisations, particularly how one establishes administrators and qualifying shareholders for regulatory purposes when tokens feature in the structures, the provisions on providing legal personality to ITAs were not included as it was considered that more detailed discussion needed to take place on the subject in view of the highly innovative nature of this proposal. This article has been prepared to discuss some preliminary issues which are being studied in the path towards implementing such proposal. The proposal relates to the design of a variant of a foundation (a universality of things) as this was considered to be the most appropriate model to build on for the context for several reasons. In this article I refer to it as an Innovative Technology Foundation (“ITF”) which is to be distinguished from ordinary foundations existing under current Maltese law. ITAs are defined in Maltese law as including distributed ledger arrangements as well and arrangements of decentralised computation, such as smart contracts and decentralized autonomous organisations (DAOs). The term “arrangement” was chosen to indicate a multiple part structure or system which is designed and organised in a manner which provides facilities for use by many parties and which may have automated operational features through computer code. It is a combination of a ledger, automated processes and possibly other elements of open source software coming together, possibly on other software platforms, such as Ethereum, providing yet more software to support required functionalities. It has outcomes beyond the actions of its designers and users and which may be relied upon by the same users to reach their own goals. An earlier contribution co-authored by the author of this article has addressed the point of whether it would be appropriate to grant legal personality to such arrangements, explaining that the software can be owned by a new form of legal person which would be designed to context. It is important to appreciate that a purpose foundation can be itself “ownerless” or “non-proprietary”. In such a case the technology functionalities and the legal personality merge very smoothly into one. That is not to say that when there are ownership interests in a mixed purpose/beneficiary foundation it happens any less smoothly but clearly with private interests we see some erosion of pure purposes linked to the software functions and purposes. Importance is given to the fact that the innovative technology arrangement has several features which already support the argument that it could qualify as a legal entity, such as a partnership, even unintentionally. Many of these arguments focus on the active participation, as opposed to intent at establishment, of many people and related consensus mechanisms and point to “associations of persons” like partnerships or companies. This is contrasted with intent at establishment through endowment of assets subject to specific purposes. The author also gave a presentation last April explaining why, in his view, the better direction of thinking on forms of legal organisations available, would be towards a purpose foundation as opposed to any form of association of persons, given the lack of associative intent of the users, the complexity of special laws like the Companies Act and the clearly identifiable purpose, which would also be public, as part of the code established by the designer in such arrangements. The software is clearly an asset dedicated to achieve a stated purpose and all that would be needed in this context is a statement of intent in English (or any other language of the developer, naturally) in the software itself or in another connected or related document, such as a white paper or a subscription document available to members of the public who wish to become users or nodes in the blockchain. It would appear to even superficial analysis that the technology arrangement would constitute a “universality of things” dedicated to a purpose to be achieved through some form of governance structure – automated or physical – and if the content and the necessary actions and procedures – most importantly registration – are respected as required by law, it could qualify as a foundation having legal personality. An innovative technology arrangement as defined in the MDIA which complies with the requirements of the law shall be considered to be a universality of things destined to the fulfilment of a specified lawful purpose, which may or may not be combined with the benefit of a named person or class of persons, which when designed, endowed or acquired subject to such purpose, qualifies to be registered as an innovative technology foundation. with the intention that such arrangement is to be an innovative technology foundation upon registration with the Registrar of Legal Persons. From that will flow a series of logical consequences which will be the subject of legal provisions dealing with all sorts of detail, some of which reflects current law and some of which will accommodate the context to support and facilitate the innovative technology arrangement and its future sustainability. The term “arrangement” takes on a broader meaning as it now encompasses certain designed legal acts which are taken in that regard by the promoters of this type of foundation. Legal personality is the tool designed by brilliant legal minds many centuries ago to address two major issues within the context of human activities. The first is capacity to carry out the very actions which produce results in a social order dominated by a legal system. Legal personality, which is a replica of human personality, implies that the legal person can carry out the same acts as humans, subject to logical physical limitations, such as marriage for example. There are many arguments in theory how it happens that inanimate objects are given legal personality and quasi-human powers. Some base it on fictions and mere intent of the law, others connect to the power to exercise intent and will in an operating context and are referred to a realist theories. In this project, we are using the reality of a complex operation with variable levels of autonomy before our eyes and then suggesting it be granted legal personality to enable it to achieve its purpose more effectively and with greater legal certainty. So you have a merger of both the fiction and the realist theories. That is how a State can best support innovative technology arrangements. 1A. (1) Persons may either be natural persons or legal persons. Book First of this Code. constitutive act or by an express provision of law. So, legal personality is the tool par excellence for solving the problem of legal powers and capacity. In the context of blockchain technologies we have this issue staring us in the face given the use cases we are seeing emerging with blockchain. We see a multitude of assumptions about the activities an innovative technology arrangement will be carrying out within our societies, being a combination of software artifacts – a ledger, smart contracts and other automated software processes – and human actions. The regulatory requirements emerging in many laws and the interface between the software and users indicates many contracts which are being or will need to be entered into. So legal capacity is a critical issue. The law usually reads through the context to an individual, usually the owner of the asset, and assumes it is his capacity that is operating. But that would also imply personal liability. Lawyers have traditionally solved the problem, sometimes through trustees and sometimes through using existing legal entities, which have their own legal personality. It will clearly be more efficient if the innovative technology arrangement itself can be granted legal personality as a special universality of things achieving an intended lawful purpose. It clearly must have all the legal powers to achieve the purpose, one of which is the power to contract and the power to sue and be sued, which leads to the second point. Legal personality has the effect of resulting in a distinct patrimony, just as happens when we are born. We all have a patrimony from birth to death which is distinct from the patrimony of other persons. It is on that basis that each of us acquire assets, which are our own, and undertake or suffer liabilities which are only our own and do not burden anyone else. It is also on that basis that we can go bankrupt when the patrimony is exhausted through liabilities, being more than the assets. With regard to legal persons the equivalent concept is very often referred to as insolvency. Distinct legal personality was the tool for limited liability of persons involved in certain types of legal organisations which allowed the patrimony, of say a company, to be available only to the creditors of the business and not to creditors of anyone else owning or controlling the company. Conversely, the rights of recourse of the creditors of the business would be limited to the company patrimony, and all the persons involved in the ownership or control of the business operations such as the promoters or shareholders, the administrators, the employees or others involved in the company would not be liable for any of the company’s obligations. All this happens because of distinct patrimonies which come to the rescue of the context. The same context can be seen to apply in case of innovative technology arrangements. Under current legal principles when someone creates or designs an operating system he is directly liable for what happens with it, as we are all attributed the effects of our own actions. Until something we create takes on or is granted distinct legal personality which produces a distinct patrimony, everything we do, which can have direct causal effects to a loss suffered by another person, can be attributed to us and we are then held liable, unless legal defenses apply. Sometimes more than one person is liable for the same act on the basis of contribution rules, which can be based on ownership or on participation in common activity. It is evident that the design, creation and operation of an innovative technology arrangement, and possibly participation in it or even its use, can fall within such a context and so creating legal personality out of the operational context to deal with third parties will naturally be a solution to the risk of personal liability to all involved. It is on this basis that some have already speculated that users or nodes on a blockchain may potentially be liable for loss caused to other users or third parties. This is one of the biggest causes of legal uncertainty in the context and must have been the basis of attribution of substantial loss across all nodes when thefts took place in one case of a large loss as a result of hacking. Without a distinct patrimony resulting from legal personality supported by a law, this may be a logical outcome – and risk – for people involved in operations such as ITAs. So legal personality will be a clear solution to this problem, particularly for users who are mostly innocent third parties participating in a very important development for our societies. A similar argument can be made in favour of designers and developers to support innovation, users which are carrying on the function of miners for the continuing operation of the systems, ancillary software developers who create DAPPS which support compliance, governance or identify management and so on. Through clearly regulated legal personality, liability will be placed squarely onto the patrimony of the legal person with whom everyone will henceforth be dealing with. That is why then we find the need in the laws on legal organizations with legal personality for publicity on the existence of the legal person, the requirement of accounts and audit to determine the extent of the patrimony, as well as other related behavioural requirements for it to have the intended effects and defensive impacts to ensure it is not abused. The extent of liability is limited to the patrimony, or estate, of the legal person. Technology which operates the accounting system and activities through smart contracts will undoubtedly deal with this issue. It will make immediately and generally available information about the extent of assets and liabilities as well as any limitations on right of recourse should they exist at law. It will generally not allow liabilities to be created unless there are assets to meet them except in specific scenarios which will undoubtedly have to be disclosed and be generally available to third parties. These are all the qualities one usually finds in public registers and while usually these are subject to rules applying on an annual basis and are seen in retrospect, in ITAs we have the wonderful potential of having all this information available publicly in real time. This may justify the shift of some aspects of publicity – say the accounts and the audit reports – from the current public registers to the innovative technology arrangement itself. This is a typical example of the positive impact of technology on current law and the opportunity we have to adjust current law to respect new realities. Legal personality brings many other things to the solution. The subject is very extensive and applies solutions to contexts within the discussion as one moves from civil law to criminal law, for example. Within regulatory law we have yet another dynamic. See-through mechanisms are used when legal personality exists with reference to an applicant. The emergence of tokens, which operate in many contexts through smart contracts, can create challenges as to who the “real” administrators and shareholders are, not only for establishing liability but also to determine who is subject to qualifying, fit and proper testing. The use of open source software is prevalent and poses a challenge in liability attribution which should not even arise for a party who has shared his work for the general public benefit and would not even be aware of the use of the software in an ITA. Another major risk for all users of a public blockchain – or even a private blockchain openly available for use to the public – is that the software underlying the ITA will be treated as part of the assets of the ITA, even as a legal person, and be subject to attachment and enforcement of claims by third parties suffering a loss. Solutions based on immunity from attachment and other non-recourse mechanisms, such as making the core ITA software owned by the legal person bankruptcy remote, are critical. In Maltese law we can also refer to the concept of segregated cells within some types of legal organisations and this gives us another design tool enabling us to distinguish between assets such are subject to recourse and those which are not. This is a further extension of the distinct patrimony concept, as a segregated cell is itself another distinct patrimony. For now I have highlighted the two main features of legal personality. Others will be addressed in future contributions. Much has been written on the above topics though sources are fairly difficult to find and it is heartening to note the development of law-focused communities in many countries dedicating time to solutions in the contexts discussed in this article. This is happening in Malta too and we all look forward to global solutions in what is evidently a cross border challenge. Until these happen we need to address challenges within our own legal systems. There are some issues which commentators throw up against the concept of legal personality for innovative technology arrangements. Others support the idea as inevitable. There are of course issues which, upon analysis present themselves as challenges. It would be good to address some of these issues at the start as they tend to return in other discussions. The principle argument made is that legal entities are by definition centralized whilst here we have decentralised structures. Various responses have been suggested to this argument, the main one being that the single ownership of a decentralised software does not make it any less decentralized, as the issue of ownership can easily be distinguished from control and operation. Indeed the single ownership of an ITA by a purpose foundation which could be, by design, an ownerless or non-proprietary structure, admirably eliminates much of that argument. Maltese law caters for purpose foundations based on very long standing Roman law concepts, reflected in Canon law and hundreds of years of court judgments. These were reflected in a specific part of the Maltese Civil Code in 2007. In 2007, the law also catered for some enhancements to the traditional concept, such as segregated cells and rules on fiduciary obligations focused on purposes. Since 2007, purpose foundations have been used as non-proprietary structures for charities, securitisations and other commercial transactions. Apart from the requirement based on a paper based world which are easily eliminated and the publicity requirements which can find substitutes in appropriately designed ITAs, the main challenge to the use of the current model of purpose foundations is the imposition of a defined form of a board of administration, usually made up of three individuals. Another challenge is the lack of legal certainty created around the potential automation of compliance and related functionalities by an innovative technology arrangement addressing mandatory legal obligations, like AML and GDPR: is it compliant and who is responsible for non-compliance? Laws deal with persons as subjects. When a legal organisation fails in carrying out a statutory duty, the responsibility falls on individuals, usually the administrators. Could the law cater for non-compliance, being a breach of contract, a tort or a breach of criminal law, by an automated arrangement without seeing through to designated individuals? Not because people are being exculpated but because there are none to see-through to! The reason for this see-through feature is common to all legal organisations, which are an artificiality or creation of the law. It has always been presumed that the purpose can only be practically achieved through people who could think and act under a presumed mandate from the legal organisation – the foundation – to achieve the stated purpose with the patrimony of the legal organisation. Likewise, only a physical person could breach the law, although after many years we now see that this has changed in many legal systems and a legal organisation is now capable of being charged with and penalized for crimes. The artificial legal organisation could not do anything itself, nor could the physical assets which are, by nature, passive. So the Romans envisaged that a collection of inanimate objects destined to a purpose would be supported by the law so that the purpose can be achieved in a more effective manner. That influenced the development of corporate law for the next two millennia but it also influenced the way criminal law reacted as the system wanted it pint of blood and no one was going to be happy with what a legal organization could provide. Could this be an opportunity to introduce a clear rule on non-conviction based liability for an an ITA organized as an ITF? Furthermore, as the purpose of a foundation is one which is long-term, or even perpetual, and would be reasonably be expected to extend beyond the life of one person, a board of administrators, the membership of which is regularly renewed as the need arises, has traditionally been seen as the best solution. Foundations can act, communicate, contract as agents, they can be sued and be held liable directly or subsidiarily. This is clearly a centralised feature. Let us assumea Board of Administrators is appointed, and is not substituted by fully by automated governance, is that a problem in this debate on innovative technology arrangements being provided with legal personality? It can be a problem as it may undermine one of the central conceptual qualities of DLT, which allows for peer to peer transactions without the need of any intervention by anyone else, supported by multiple nodes without the need of any central organ or body. But that depends on what the Board of administrators can and cannot do or rather what they actually do. Let’s look at the functions of this centralised organ. The first is administration of the relevant assets belonging to the organisation to ensure that it achieves the designated purpose. In this case, the administrators would be administering the blockchain software and smart contracts to the extent that they need administration. What if they do not need any? Is a centralized board of administrators still a threat? The second is to administer non-relevant assets – generated through investment – to support the principal purpose and to hold a patrimonial pool to cover any obligations it may enter into, including potential liabilities. This is the main fiduciary function of the board consisting of administration of assets belonging to another to achieve the designated purpose established for the legal organisation. Same question as above. What if the direction of cash flows to liability pools to cover obligations (costs, distributions, debts and others) is automated, rendering the administrators unnecessary? What if the law allows that the board of administrators is effectively disintermediated on many key functionalities, so typical of what blockchain does! Would the central administrator or administrators still be a threat? 4.1.2 The relevant asset here is the software which is now capable of automation and this can be further enhanced through smart contracts. Once designed to operate in a certain way to achieve a defined purpose – which can be as simple as to host user wallets and allow for peer to peer transactions with their assets – the bigger debate taking place is whether the software can be changed more than whether it will do what it has been programmed to do. What Maltese law has proposed in the law enacted to address ITAs is that the Malta Digital Innovation Authority – the new regulator for this sector – will certify the arrangement if positively assessed by a systems auditor to do what it says it is programmed to do. So if it is programmed to administer its assets, to receive and accept additions, to apply its assets to the purpose, to generate and apply assets from transactions and so on, we do not need administrators to do so. In Maltese law we have designed a role for a human functionary – called a technical administrator – but that relates only to what he is engaged to do, apart from some very limited functions required for certification under the law, and anything beyond that is up to the software. This should not contradict the proposition. 4.1.3 Then there is the administration of assets other than the distributed ledger, being mostly the initial capital, cash flow which is paid out of some wallets to others pursuant to smart contracts which automate a series of payments from transactions or other sources, which could be an ICO, so as to implement the capital fund which is available to promote and achieve the purpose of the arrangement. These are payments for the ITF to meet very ordinary payments such as annual registration fees, annual returns, taxation, accountants and auditors, including systems auditors when needed, the technical administrator’s fees, lawyers, rents, if premises are required, websites and communications strategies and the like. These can all be automated to happen when due but clearly the movement of money into an administrative pool must happen to allow for contingencies, and variations can even be predicted and programmed to happen based on formulae. At some point, however, as not everything can be predicated, one will need a physical person to act and this could be the technical administrator, though this was not envisaged in the minimum requirements in the ITAS. This is a task which could reasonably be carried out by the local agents in Malta. Our laws contemplate a VFA Agent and a local representative for different contexts. If they are willing to so act and the promoters have sufficient confidence in their abilities and consider their fees reasonable, then there is a ready solution as these are clearly physical persons. We must however ask: is there a problem to appoint an administrator with defined and limited powers and functions to carry out these functions? Will this make the arrangement inconsistent with the decentralised technology? Will this upset theory to such an extent that the ITF being proposed in Malta will not be a potential solution to many of the problems out there? Will the quality of the proposed solutions re-dimension the theoretical arguments? 4.1.4 Then administrators act in a representative capacity and bind the foundation through contracts with third parties, some of which could be very important for the security and credibility of the operations on the DLT platform. Every achievement of a purpose requires the interaction with third parties. The engagement of the administrators themselves is a contract as is the acquisition, donation or endowment of the assets dedicated to the purpose, in this case all the software which is owned by the ITF. With regard to the software not owned by the ITF there are contracts often caught under the term “licence agreements”. For these to be valid someone has to accept them on behalf of the organisation and the members of the board of administrators usually do this on behalf of the organisation. The engagement of staff, the investment of assets, the purchase and sale of assets, the distribution of assets by way of support of the purpose and hundreds of other actions are all contracts which need to be binding on the parties, including the organisation, as these are bilateral or multilateral agreements. It is not possible to complete everything one needs for the future operation on inception, and things happen from time to time and need intervention. Is it a problem to have a solution of an available administrator, or merely a representative, for where it is needed which is set within parameters of a vision – the decentralization of an automated DLT? Some still insist that the centralised nature of a board of administrators must be a problem. That is only correct if one disregards the context of innovative technology arrangements which can provide a completely different approach to the above issue through its power of automation especially through smart contracts. This realisation allows us to think outside the box and cater for effective alternatives to the long held tradition of requiring a board of administrators with full powers vested in them to do everything, in all legal organizations, continuing from the premise that a legal organization cannot exist or act without an administrator. One function of administrators is to act as a representative. When smart contracts operate in situ there will be no need for legal representation or legal capacity as the context is past that stage. We can now design solutions based on context – the features of blockchains and smart contracts – which allow us to actually either eliminate or possibly decentralize and disintermediate the board of administrators and many, if not most of its functions. If we eliminate the board then the issue goes away. If we decentralize the functions carried out by the board then we no longer have a problem of the same impact on the central features of the innovative technology. This will depend on context and maybe we can do a bit of one thing and a bit of another and give the developers choices which will enable them to maintain the integrity of ideas. The best solution appears to cater for a range of possibilities from 100% automation to very little automation and allow for different calibration on different topics or matters. The argument I would make is that once you open the door to automation of governance structures, even if limitedly, and you recognise the combined dynamic of automated operation and participation of human action in the innovative technology arrangement, you have done enough to permit a quantum leap to a new set of rules on legal personality. In Malta we are working on a variant based on the impacts of innovative technology. It may not go so far as to meet the imagination or ambition of some through the imposition – leave no choice or flexibility to developers – of a completely human-less distributed autonomous organisation which is fully self-automated. Leaving a choice in design still appears necessary and in some contexts important. One can imagine a time when technology will develop to make this unnecessary as all will be automatable and flexibility today will not hinder development in that direction. One should remember that the central asset of the foundation will be the innovative technology arrangement – the software – and everything will be taking place within its confines. Much less will be done outside and these “external” actions can be identified and placed within the responsibility of a physical person or more than one. This has to do with governance of blockchains and smart contracts on which much has been written already with different focuses. Of course, a time might come when this challenge will be met, maybe by AI, and human actions may no longer be required in any context. It can be noted that some of the external actions could themselves also be other ITAs which have functionalities which the relevant ITA itself does not have. Oracles can also be used to verify information which can be the basis of action by the ITA and that can itself raise very difficult questions on liability which are usually addressed in the contract between the ITA and the Oracle. Having a board of administrators, people, will not even know these things are happening through the technology and so there is ample justification to adjust our long held views on who should be liable, but to the point we are now discussing, where does that cause a problem to decentralization? We have to imagine a time when the whole package of governance functionalities, fully compliant with the law, will be designed to be plugged into by the ITF! 4.2 Are different, unregistered and non-compliant structures recognized as equivalent to ITFs? Another doorstop issue which also needs to be addressed is the issue of whether an innovative technology arrangement could be considered to be a legal organisation if in a different form from an ITF, if not within an ITF or if not in compliance with the requirements of the proposed ITF law. Another way of asking this question: can one have an Innovative Technology Company or Partnership or an irregular ITF? The ITF law will not only be an enabling and empowering law to support the new industry around ITAs but it will also impose conditions on standards and modes of operations and behaviours. In the ITAS, Maltese law already requires a systems audit for an ITA to be certified by the MDIA. It is therefore evident that with the benefits must come burdens. That would imply some clear strategy on what happens when existing and traditional laws on legal organisations are used by promoters as well as when promoters either intentionally avoid them or adopt them irregularly. were to be set up to own and operate the technology? – would the proposed regime apply if the promoters set up a partnership or an unregistered association which are recognized legal organisations but which do not have legal personality? – would the regime apply if a promoter does a lot of what the new rules require but then fails to comply with the proposed law and register the ITF under it? Under standard legal thinking in this area, it is the intention of the persons who promote a legal organisation which leads to its creation as it is they who state its purpose and then choose its legal form by pursuing the formal and procedural rules for the creation of the organisation they intend to create. Registration in a public registry may or may not be a key requirement and what is clearly evidence of intent to create a legal organisation is a statute in writing according to a stated formula with a mandatory minimum content. Some legal systems require registration for publicity and others grant legal personality on the basis of registration. Malta follows this latter rule. However many legal systems still recognise legal organisations even if they do not have legal personality, as does Maltese law. These are called unregistered organisations which do not have legal personality and the legal effects are usually more limited with liability burdening the persons involved, unlimitedly but possibly in a subsidiary manner. So it is clear that once it is agreed that a technology arrangement involving an ITA, smart contracts and participants has all the elements needed to establish a legal organisation, it is easy to see that the very fact situation can result in an interpretation that the parties involved have impliedly created one or more forms of legal organisations – those which do not need a written statute or registration. Likewise it is easy to see that if a statute is written and signed, or subscribed to by additional participants, then that fact situation will lead to the emergence of yet other forms of legal organisations which are now formally existing rather than merely implied. 4.2.1. stating that any actions, including written statutes, which seek to create a legal organisation around the factual context of innovative technology arrangements shall have no effect and will neither create a legal organisation nor will it create a legal person under the law, impliedly or constructively. It is recognised however, that these actions may reflect valid actions of individuals who have capacity. If the purpose (causa) is lawful, they will produce some legal effects, which can obviously impact on consumers who engage in or with such arrangements. This can be very dangerous and damaging and so it is suggested that the law should declare expressly that such actions will be deemed to produce only a personal right or obligation or, if multilateral, a contract, or a series of contracts, between the parties for which the actor will be personally and unlimitedly liable, both civilly towards third parties should they suffer loss or under statute or criminally should a breach of a mandatory statute or of a criminal law take place. It is also recognised that the ITA can be owned by a registered limited liability company, a traditional foundation or other recognised legal form of organisation and in that case then such organisations will be the “actors” with the above consequences until such time as they convert to the new form of foundation being proposed, which will then of course extend all the legal regime to the context. 4.2.2. stating that notwithstanding the establishment of a legal organisation through all relevant procedures and forms (including for it to acquire legal personality, as would be the case with a registered company, for example) unless the organisation is a properly registered ITF, the legal effects in the new regime will not arise and the liability of all persons involved will be governed by the laws applicable to the selected legal form. This will be choosing to adopt the uncertainties of current laws and foregoing the new facilities which can enhance the protection to users and promoters and allow for new ideas to be implemented reflecting the new decentralised and automated contexts. The existing legal debates will continue for some but not for others. It is not considered appropriate to prohibit this freedom in view of other provisions of Maltese law which recognise the freedom of individuals to set up legal organisations as they see fit. One might have to consider some other forms of consumer or investor protection rules, as users may not be aware of the strategic options the promoters have when establishing an ITA in so far as the legal form and structure are concerned. It is true that this can also create some confusion in the market but we have been used to multiple forms of legal organisations with different legal effects for centuries and this should be tolerable. The big question will be whether the MDIA will certify an ITA in that context, i.e., where the promoters advise the MDIA that they will vest the ITA in a legal organisation but will NOT be using the legal form of an ITF for their project. This is a policy decision which the MDIA still needs to consider. To date the law does not state that for an ITA to be certified it must be embedded within an ITF for the simple reason that ITAs are the subject of a legislative project which has not yet been completed and is still a work in progress. In the author’s view, when the law on ITFs is enacted and the option is granted in a way that will protect consumers, investors and the national interest in a better way than other existing legal structures, then the ITF should be part of the certification requirements of the MDIA with regards to certain complex ITAs, such as public and permissionless ITAs with multiple smart contracts. This approach would be one step short of prohibiting complex ITAs to be structured as anything else other than Maltese ITFs if they are to operate in or from Malta which is of course the final option in this debate. Controversial and in need of more debate, especially from the angle of the need to be technologically neutral in approach. This appears to be the dominant view supported even in legislation; however, the context of some technology having self-automation features may need to be given legal effect. While this may raise a new risk of uncertainty, as with new technologies, the law may find itself stuck in a time frame, technology may no longer be neutral in an absolute manner. Unless, of course, we invent self-automating laws which can automatically adjust to context as innovation occurs! Maybe what the MDIA should do, in line with the pace of development of the technology in this field and consistent with Malta’s strategic direction, is to provide the non-compliant structures with (or make available, or just impose) a mandatory suite of smart contracts which will ensure that the non-compliant legal organisation – or simple ITA – will act in a manner which is of sufficient quality on critical issues, and tolerate that what is not within the critical list of behaviours is left free of imposition. If that happens we will be applying the excellent approach of substance over form through technology, not bothering about legal shapes or forms but ensuring that compliance on critical issues is respected outside the realm of an ITF. This may be necessary because there is no law of Malta which makes it mandatory to certify an ITA – the ITAS is a voluntary regime. Of course the benefits of an ITF cannot be extended outside the design if they do not already exist in the context of a simple ITA or in other legal or non-compliant forms. 4.2.3. An ITA will therefore have the benefit of an ITF only if there is full compliance with all matters of form and substance as required in the new law and it is properly registered with the Registrar of Legal Persons as required by the new provisions. No other configuration will produce the full effects of an ITF, directly or indirectly. The new regime will be an extraordinary grant of legal status in a very innovative context. It will bring high levels of legal certainty to various aspects of the discussion about ITAs, including that on liability and recourse. It will extend clear protections to users of the technology through the use of segregated cells which can even extend to immunity of some of the technology from attachment and bankruptcy, as that is the only way to protect users from actions of third parties. That needs legal personality to be properly in place. It will give clear rights of action on specific assets and cash flows to creditors. It will start setting out the limits of liability resulting from autonomous actions and fiduciary duties which provoke the need for intervention to avoid loss and breach of law. 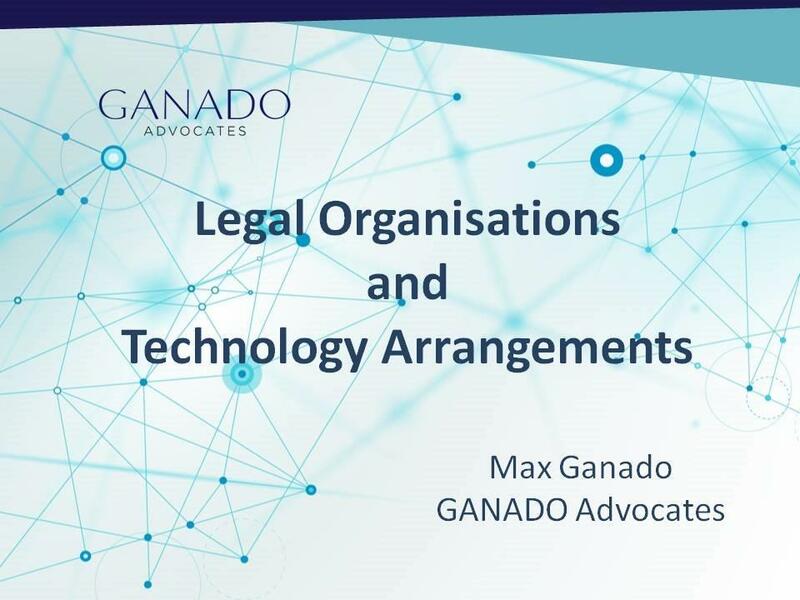 Dr. Max Ganado is a Senior Partner at Ganado Advocates which is one of the larger law firms in Malta with leading teams on several specialist areas of law including financial services, shipping and aviation and corporate. The firm has taken particular interest in the Fintech and blockchain area over the past three years and has a team dedicated to its impacts in key areas of specialisation. Dr. Ganado leads the core team on the new legislation being proposed for Malta. Dr. Ganado has been responsible for the drafting of several pieces of legislation at the request of the Government of Malta and its agencies. These include some laws relevant to the topic of blockchain such as the provisions on derivatives, in particular on close out netting, the Securitisation Act, regulations on custody of securities, the Proposed Bill on a Central Registry for Malta, the general law on legal persons, including associations and foundations, and on segregated cells in legal structures. He was also involved in the drafting teams for the legislation relation to shipping and aviation, including the relative national registers and on incorporating trusts into Maltese law, mainly a Civil Law system, and on voluntary organisations, their enrolment and supervision. He also participated in the EU working group on Legal Certainty in relation to the holding of dematerialised securities through book entry systems. He is an external lecturer at the University of Malta and regularly contributes articles and has authored or edited several legal publications, and lectures locally and internationally on legal subjects on which he specialises. He is a Board member of Blockchain Malta Association. The author would like to thank Christine Borg, Steve Tendon and Joe Ianelli for their helpful comments on earlier drafts of this article. Thanks are also due to my colleague Dr. Ian Gauci who has contributed to the debate with detailed analysis and suggestions in the context, particularly around the idea of DAOs. 3. any other innovative technology arrangement which may be designated by the Minister, on the recommendation of the Authority, by notice from time to time. (b) for the benefit of a named person or class of persons, and are entrusted to the administration of a designated person or persons. The patrimony, namely assets and liabilities, of the foundation is kept distinct from that of its founder, administrators or any beneficiaries. It should be acknowledged that legal systems also give some legal powers to unregistered organisations based on the factual reality of their existence and activities they carry out without attaching or extending to them a legal personality. This is complex and uncertain in this context as will be discussed below. Using the vending machine comparative we can imagine a question: should the vending machine run out of drinks, will not the software refuse to accept payments, or if coins are taken will not the software ensure that the machine would immediately and automatically return them back to the payor? The author has been long promoting the argument that when an innovative technology arrangement is opened to and made available to the public to use to store and transact with their assets, it is unacceptable and disproportionate to allow the very public technology or infrastructure to be seized and enforced upon by a creditor of the owner of the infrastructure. Can anyone image that happening with a public land registry? Such publicly available infrastructure should have the status of public domain and be held by the owner – if there is one – on a fiduciary basis for all users. Creditors should know this in advance and while they too can be protected through income generated on the platform, they should not be able to freeze or attach it – stop it from working for the community using it – affecting all the public member users and their assets. Of course there are many detailed implications emerging from this argument which will be the subject of another article. A wonderful discussion on this subject takes place in many writings of Primavera De Filippi and Aaron Wright reaching seriously inspirational levels in their recently published book “Blockchain and the Law – The Rule of Code”, Harvard University Press, 2018. Reference is made to Chapter 8 on “The Future of Organisations” where many relevant issues are discussed in some detail. Reference is made to a purely lawful purpose foundation which can be distinguished from a beneficiary foundation. Both can be private or public benefit. This is a requirement under ITAS when the key persons involved in an ITA are not present in Malta.